Baby dry skin rash: Everything you should know about it to treat it right! Skin appearance , symptoms, causes and solutions. Check it out now! Is Dry Skin a Symptom of Eczema? 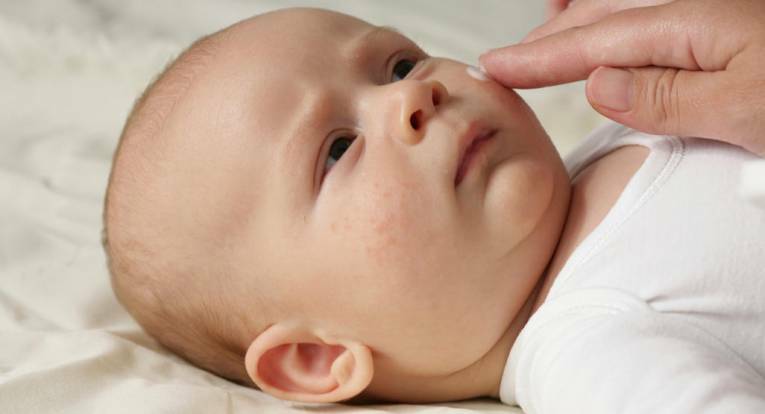 Many newborns experience issues with dry skin. The skin of a baby is very thin and sensitive. It is not yet developed enough to produce the oils that moisturize the skin. By the time a baby becomes an adult, the skin tissue is fully developed. Just out of the womb, however, newborns are particularly susceptible to dry skin because the oils that moisturize it aren’t yet being secreted. This is why we often see newborns with dry skin or some form of dermatitis. Dry skin can manifest in many forms: redness, flakiness, or a leathery texture. There are a number of causes that result in patches of dry skin. As mentioned above, the sensitivity of a newborn’s skin makes it more susceptible to dry skin because it’s still only at a developmental stage. Some babies are more likely to have dry skin than others, but all babies are more at risk during the winter months. This is for two reasons: first, the cold, biting wind can wreak havoc and dry out skin. Second, cold weather means more artificial heat indoors. Dry, overheated indoor air is the most likely culprit of a newborn baby’s dry skin problem. The environment absorbs moisture from the air. Thus, the skin of the baby becomes dry, and patches of dryness become visible. The summer months are not as detrimental to a baby’s skin, but being in the sun too much or for too long can dry out the skin. Similar to winter months, air conditioning to make the temperature cooler indoors can cause patches of dry skin to form. Generally, then, drastic changes in temperature and humidity in the air are two of the most important causes of newborn baby’s dry skin. Harsh chemicals are an added factor, too; particularly when swimming. Both the natural salt of the ocean and the chlorinated water of an indoor swimming pool can cause patches of dry skin in babies. Parents constantly worry about the health and welfare of their baby. First-time parents can be particularly anxious. 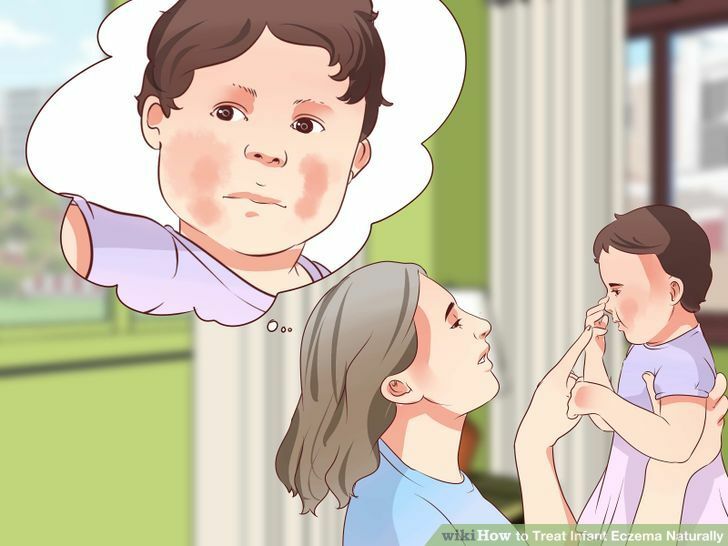 When a mother or father first notices dry skin appearing on their newborn, they immediately panic and assume it must be the first signs of eczema. Due to being uninformed about the specific symptoms of a host of diseases and ailments, it is logical that parents would react like this. Most people don’t know the technical difference between eczema and dry skin. The reality is, the two are very different. Normal dry skin is just that: dry and flaky. Eczema, however, actually causes the skin to crack and bleed. It looks a lot more like sores than just dry skin. Normal dry skin isn’t painful, but eczema can be very painful. Obviously, it’s hard to tell if your newborn is in pain since they can’t talk yet, but the physical differences alone make it easy to differentiate between the two. Is it a symptom of eczema? There are instances when newborn baby’s dry skin is neglected for a long time and can develop into a mild form of eczema. It is important to moisturize your baby, so their dry skin heals. This doesn’t happen in every case, but it’s always best to be safe. Because their skin is so sensitive, it is recommended to bath a baby in warm (not hot) water for between three and five minutes. Hot water causes the skin to seize up, leaving it more vulnerable to damage. Moreover, don’t over-scrub the baby’s skin when you’re washing them. Use a soft flannel cloth and a bath product that is marked as suitable for babies. This is the most important treatment for newborn baby’s dry skin. Make sure not to use any of those cheap or overly fake products; the ones that smell like a woman’s perfume or a man’s cologne. Use something fragrance-free and check the label before buying to make sure it doesn’t contain any harsh ingredients. Look out in particular for moisturizing and healing ingredients like baby dry skin coconut oil or aloe vera. I love the smell, how it spreads once melted in hands and absorbs to moisturize my 21 month old's skin. She has had dry skin likely with eczema (I had it when I was a child also). Her cheeks are the worst and it's taking a bit to heal - some review said cleared up with one use - not in my child's case. We Haven been using it for 4 days now. it's not cleared but I can tell the difference though! The body is definitely better!I have trimicinolone oil prescribed by her pediatrician which I use once a day or every other day. It used to clear the skin with one use but her eczema seems to be more stubborn. It is winter time so I know that has a lot to do with it.I also switched to Mustela Stelatopia body cleanser, and I switch her toddler tub water once I wash her to clean water and I put few drops of rose hip oil to bathe her in for at least few minutes. Combination of all is probably helping her skin recover slowly but surely.If this brand has bath emolient it will be awesome!! Maybe I could mix this thing in the bath water. This stuff works wonders on my baby’s hair and skin! He has horrible eczema and extremely sensitive skin. I’ve used everything and for a while only steroids would clear up his flare ups. He also has cradle cap so bad his scalp will get scabs. After 2 days of using this his skin is clearing up and the scabs on his scalp are smaller. It also makes his curls soft and look great! It is so worth the price and I love that it’s completely organic and smells great! My husband also uses it to condition his beard and loves it. That’s a plus since our baby gets his sensitive skin from him! Great Gift Idea. I used this product for my newborn 1 time per week. (We live in Michigan and the temperature changes frequently causing skin dryness and other irritations which affects skin.) The oil works great to moisturize my adult arms and legs as well as our newborn baby’s. I loved the feel of my skin as well as the shiny glow. You do not need more than two quarter sized amounts for adult arms and legs. The oil absorbs quickly and does not appear to leave oil marks on clothes which was a huge bonus for me. I would recommend to anyone but I advise to use only on the arms, legs, and scalp. The oil Smells great. I love that the product tells you it has organic as well as natural products and to put in the refrigerator to solidify in temperatures that are 75 degrees or above. My son for some reason attracts bugs (all kinds) all the time. With all the Zika news lately I decided to give this a try. It is worth every Penney. We tried it when we went to Alabama for my older son's Baseball World Series and it worked great. No bites whatsoever. Will purchase more just to keep stock. Works to keep the bugs away. Don’t go crazy with the air conditioning. In the winter, make the house as cold as you possibly can without it being too cold. Overheating the re-circulated air isn’t good for you, and it certainly isn’t good for your baby. Similarly, in the hotter months don’t make your house as cold as the Arctic circle. Keep things comfortable, but avoid drastic temperature changes when possible. A general reminder: the bigger the difference between the temperature indoors and outdoors, the more your baby’s skin will dry up. I tried this lotion after originally trying the Johnson&Johnson moisturizer, which ended up leaving my baby's skin flaky and dry. This moisturizer worked wonders! I really like the smell, and it didn't dry out baby's skin. We use it after every bath! No mineral oil! Much better for babies (look it up)! We've always used baby magic with our 22 month old and this extra moisturizing cream is so great for his cheeks and hands after his been playingout in the cold. His doctor told us that babies lose 2x the moisture just to the air throughout the day than adults so we slather him up all the time. This is the same great smell of the regular formula. It's really not much thicker either. Choose soft and gentle fabrics for your baby. Dressing them constantly in denim is a big no-no, as denim tends to chafe the skin. Cotton is probably the best option here. Then, when it comes to washing your baby’s clothes, consider carefully the detergent you use. Take a while to read the labels the first time you buy detergent after having a baby, so you get to know which is most natural and is the least likely to irritate their skin in any way. If you’re really noticing your newborn baby’s dry skin and have tried all of the treatments above to no avail, you should invest in a humidifier, a device that actually adds moisture to the air. You might even think of buying a natural salt lamp, which generally improves the quality of the air. Back in my home country, after my son was born, we started using Johnson and Johnson baby wash. We did not get this brand there. But he developed red spots and such on his skin due to that. So doctor there suggested to use a mild shampoo and other things like Lotion and such. They recommended Sebamed products which were imported from Germany and hence also very expensive. A 8 oz bottle of wash was like $9 (yes that is crazy expensive in my home country currency) when you could get Johnson and Johnson etc for under $2. We went ahead and started using sebamed everything from body wash to lotion to shampoo and even diaper rash cream.Then we came to US and initially I got sebamed here as well. But then we read about Aveeno and though this is also expensive compared to equate and other such brands, but still cheaper than sebamed and availability was plenty at walmart, kroger and such. So we tried this and this things also works very well for my son and he seem to have no problems with it.I suggest doing a subscribe and save on amazon for this product and would recommend to any parent here for their babies. As a first time mom, I only knew about Johnson & Johnson products. So naturally, my initial instinct was to use the Johnson & Johnson baby products I received during my baby shower. I wasn't impressed. My second son didn't respond well to their products and seemed to get a mild rash every time we used it. After some research, we decided to give Aveeno a try. We absolutely loved it. Aveeno has a mild scent and is gentle on his skin. Two years later, I am still using Aveeno products on my son and now on my newborn daughter. It's so gentle, I even use it on my own skin 🙂 love the way it cleanses my face. Here's another little plus...great to wash makeup brushes with!!! Don’t bath your baby more than you absolutely need to. If they’ve just had a bath and got messy during the day, for example, use gentle baby wipes instead. Dry your baby as soon as they’re out of the bath. When you dry them, put the towel over their body gently: don’t rub. Use soft, fluffy towels, not old ones that feel tough. Wrap your baby up nice and warm when it’s cold outside to protect them from the wind. Keep a tub of petroleum jelly handy at all times. It works great for dry skin. Sure, it can be a little greasy: don’t use too much or your baby might slide around as if they’re ice-skating! Try to find baby products that contain oatmeal. Oatmeal works wonders on dry skin. Hydrocortisone is another ingredient to look out for. It’s found in a lot of dry skin products and is well known for its healing properties. After trying damn near EVVVVEERRY THING on Kayla's eczema and it just seemed to get worse. I didn't really want to use a steroid cream because it thins layers of skin and wanted that to be a last last resort. She was getting dry patches on her shoulders and elbows.and her face was very inflamed. I felt so bad for her because I have eczema so I k ow how it feels. I found something that ACTUALLY works.. After hours of research i found Mustela Baby products.. It had over 141 reviews on amazon with only 7 being one star the rest three and above with the about 120 being four stars. So I figured I'll try it.. this stuff right here.. Is pure magic!! Look at the results after only applying it twice. Last night and the night before.. The after picture is the beautifulness I woke up too today.The before was two days ago before the first application.. Its hypoallergenic, free of fragrance, colorants, and parabens... And no mineral oil , the sunflower oil is the active ingredient.. Now this stuff is expensive ..$ 22.00 for the cream and $14 for the shampoo... And that was targets clearance price... But I must say WELL WORTH IT!! they have a whole set for $39 which I will be going to get. If your babies have sensitive skin like me and my babies but if he does This stuff ABSOLUTELY works! After trying Aquaphor, hydrolatum, vanicream, cerave, aveeno baby and many other lotions for my daughter's eczema, this lotion is the best for eczema. After a few days of use, my daughter's skin is smooth and the eczema goes away. Anytime I try a different lotion, I regret not sticking with this Mustela product. Don’t rush to conclusions: your baby probably just has a mild case of dry skin; not eczema. If you take heed of the advice above, it is likely that your newborn baby’s dry skin will become soft and supple. If their dry skin condition persists, however, consult your family doctor. They will have access to more sophisticated moisturizing products than those available over-the-counter and can monitor your baby’s progress according to the dosage requirements. No matter what, though: don’t panic. Dry skin on a newborn baby is very common. Just do what you always do: be a vigilant parent, treat it regularly, and it will most likely disappear within a couple of weeks. Still not sure? check out if your baby has one of these different types of eczema here! When can you put lotion on a newborn dry skin? at her birthday, my newborn had red itchy patches everywhere on her body except the face. The doctor said it was an allergy to clothing. It’s not common at all but it happened to my poor little baby. Thankfully eczema cream was working great. It calmed down immediately the baby and few hours after all red patches dispeared for good. I think it one of must have things in young mother’s medicine box. Thanks so much for this complete and clear article!